If you want to literally cut your cutting time in half you can actually run two Silhouette machines at the same time - and they don't have to be cutting the same design or even cutting from the same work area. I recently got my hands on a few rolls of high gloss permanent vinyl from ProWorld. It was the first time I've used their vinyl and I was anxious to try it out. This was a perfect excuse for cutting with two machines - I got results in half the time! Here's how you're going to do this. First, you need Silhouette Studio Business Edition, so grab the one time paid upgrade and then let's get started. In Silhouette Studio open up your first design in a work area. In a second work area, open up another design from your library or that you've created. TIP: To open up a new work area in Silhouette Studio go to File > New. Do all your editing and designing and get all designs ready to cut. Now, you'll need to get your two machines set up. These can be two CAMEOs or a CAMEO and a Portrait or two Portraits...you get the idea. For this demo I'm using my CAMEO 1 and CAMEO 2. Plug both machines into a power source and plug the power cord into the machine. Then run a USB from each machine and plug each into a separate USB port on your computer. Power on each machine. Placing the computer in the middle with each machine to one side is the easiest arrangement I've found. Now it's time to prep the vinyl. The high gloss permanent adhesive vinyl rolls from ProWorld are 15" rolls so you can use my little trick for cutting down 15" sheets and rolls. Trimming off 3" of vinyl (red line) to fit on the 12x12" CAMEO mat usually means you waste that three inches. 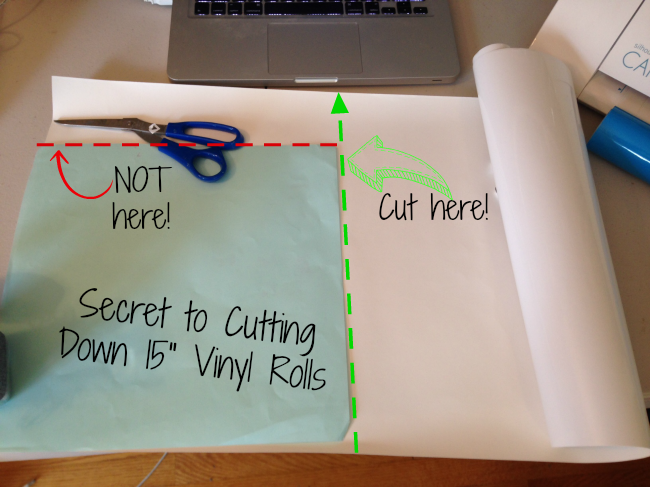 So instead, roll out the vinyl roll and grab the cover sheet for your cutting mat. Lay the cutting mat cover sheet on top of the vinyl lining up the bottom and left edge. Cut across the width of the vinyl, using edge of the cover sheet as a guide, so you're left with a 12x15" piece. This typically results in far less wasted vinyl! Repeat for the second color of vinyl (PS: don't you just love this blue color?!). Place each piece of vinyl on its own cutting mat and load each mat into one of the machines. Go back into Silhouette Studio. In the first work area, in this case the Home Sweet Home design, go to the Cut Settings and set up for a vinyl cut like you would for any other vinyl cut. Repeat in the second work area. Double check the blade settings in both machines and adjust to a 1 or 2 for vinyl if necessary. DO NOT send to cut from this window...you may accidentally cut on the wrong machine and waste all that awesome adhesive vinyl from ProWorld. Instead, open up the Send to Silhouette window from along the top tool bar in Silhouette Studio. I'm cutting the Home Sweet Home design on the white vinyl which is loaded into my CAMEO (1) so I want to click 'START' in the CAMEO pane. The cutting will begin. Once that gets started, I can click into the next work area where my anchor is by clicking the tab at the bottom of Studio. From there I click "Start" on the CAMEO 2 pane. Now, both designs are cutting at the same time. At this point both designs are cutting simultaneously. Both vinyl designs cut and weeded like butter on the high gloss vinyl from ProWorld. In just a matter of a few minutes I had both of my designs weeded and ready to be applied to their surface. As for my first experience with ProWorld's vinyl - I'm a fan! Google’s Analytics 360 Suite - Jaipur School of Digital Marketing | Training Institute Now Google is one of the biggest part of everyone’s daily life and plays a very important role in today’s competitive and marketing world and every time it comes up with a new announcement and new strategies for the betterment of marketing measures and now a new announcement launched by Google is Google Analytics 360. Awesome. What blade settings did you use to cut this with? Can you cut with both the Cameo and the curio at the same time? If I have one Cameo at home and one at the studio do I need the business edition software or can I simply use the one already installed? I will not be running them at the same time. Is there a difference between the Designer Edition & the Business Edition? Does this multiple machine method work for Cameo 3 with Cameo 2? I tried to plug both in and it only shows 1 or the other on the cut screen... anyone else have this issue?? Can i make it with the help of Video editing software.